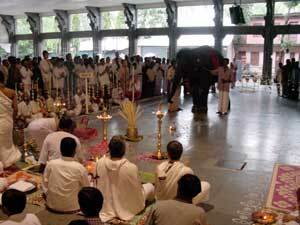 Sri Ganesha, in the form of Ram, the ashram elephant, was led into Amritapuri’s large hall at about 8 a.m. this morning. The waiting devotees received Him with expressions of joy, for today was His birthday, Ganesha Chaturthi. Standing within an area cordoned off by elaborate kolam designs (decorative patterns made out of rice powder), coconut leaves and golden hibiscus flowers, Ganesha, was offered flower petals by the ashram pujaris, and lively bhajans by the ashram residents and visitors. The entire ashram turned out to offer their adoration. At one point, the bhajan, “Gajanana, he Gajanana” was reaching it’s climax. Sri Ganesha (Ram) responded by raising His trunk and holding His head high, while stretching out His front legs and bending toward the ground. The effect was a graceful bow, which was perfectly timed with the music. With trays full of fruits and other offerings spread out before Him, Ganesha was fed and arati was waved before Him. As the puja ended and Ganesha was led out, He poked His head into the Indian store, and the girls working there got the chance to personally offer Him some fruits. felt guilty about it. But, this is the most stabilizing and centering experience Ive ever had, and its surprisingly easy! this earth, our home? For those who want to reach this goal, Amma has provided this gift.May its fragrance spread throughout the world. The story begins in Rhode Island, when a handful of Amma’s Western children sang Michael Jackson’s “Hold Me”, the theme song to the movie, “Free Willie.” Already a touching song with spiritual implications, with just a few adjustments in the lyrics, the song was transformed into a heartfelt tribute to Amma. But it wasn’t just a song. The singers had assembled an impromptu troupe of dancers to stand in the back of the room and wave their hands back and forth in unison. As Amma responded enthusiastically and the song crescendoed into a joyful celebration of God’s love, almost everyone stood up and danced, the room transformed into a sea of white, the tide of love rolled in. Amma’s eyes shone as She gazed out at Her children’s innocent plea for Her love and attention. At Amritapuri recently, Amma asked the same children to sing the song again. But it wasn’t only the song She wanted; She also asked that people should wave their hands in unison the way they had done in Rhode Island. So during the height of the Western Canteen dinner rush, a few of the singers called all the Western children closed and entreated them to quite literally give them a hand the next day when they were to sing the song. This morning, after Amma started giving darshan, the singers went to Her and told Her they planned to sing the song at 2:00 pm. But Amma asked them to sing at 1:00 pm instead. Then ensued a mad dash to the flats, where the singers went door to door informing the dancers, (i.e. nearly all the Western children at the ashram) that the time had been changed from 2:00 to 1:00 pm. The Western Canteen lunch, which normally starts at 1:00 pm, would have to be postponed, as many of the girls in the kitchen had to be there to sing for Amma. But in the end it didn’t matter, as there wouldn’t have been anyone in line to eat, either. 1:00 saw the temple full with shining Western faces, eager to fulfill Amma’s request. the room began to sway back and forth. Tell me will you hold me? When wrong, will you scold me? Amma had started to wave Her hands back and forth, too. When their Mother started, it was no longer a Western celebration but a human celebration, as all of Amma’s devotees joined in the dance. Was it a bit unconventional, a Michael Jackson song in a temple? Maybe so. But Amma celebrates the good in everything–in every person, every circumstance, every culture, every faith. Here was an innocent, heartfelt prayer in the form of a pop song. Amma made sure that it was heard by all. When the song was over, Amma had the song translated and read out in Malayalam, so that everyone present could understand the song’s words. 100 medical students from Amrita University came to Amritapuri and received the blessing of a private group meeting with Amma today. Most were meeting Amma for the very first time, and had just completed their first 2 weeks of life in medical school. This batch of new students is the first since the school was conferred University status by the Government of India, and respresented those chosen out of a pool of 2000 applicants from every state in India, and even countries abroad. All sat before Amma in rapt attention as She lovingly talked and joked with them. Amma began by discussing the value of the medical profession and how it should be viewed as a blessed career. She spoke of how doctors have a unique opportunity to relieve the pain and suffering of people, through both the treatment itself and through loving and compassionate care. Those who are suffering from illness or injury are the ones most in need of peace and relief. The doctor, who should learn how to identify with other’s pain, feeling it as their own, is in a position to bring happiness to those who need it most, mentally and emotionally as much as physically. In fact this is essentially the root of true compassion and spirituality itself: seeing all as oneself. This is one way that practicing medicine can be a sadhana. Amma continued to say that all of the students should view the practice of medicine as a chance to serve God through humanity. She implored the children to, for Her sake, please accept the difficult school years ahead as an opportunity and a tapas (spiritual austerity), which will bear fruit later. Amma then gave the example of hot coffee. “The heat does not belong to the coffee, but was borrowed from the fire. Your mind is the fire,” Amma said. “No, I want to talk with you in private, Amma!” (a sentiment many of Amma’s devotees can sympathise with!). So, Amma waved him toward Her as well. Only when he reached Her, instead of talking he simply fell straight into Her lap, where he remained for the next few minutes! Then, a third made the journey to Her lap. And then a fourth. Such is the spontaneous attraction that pure love generates. Happiness and gratitude radiated from the student’s faces, as everyone drank in Amma’s compassionate words and bathed in the blissful atmosphere. One had the sense that all were feeling profoundly fortunate to have a great World-Teacher such as Amma instructing and guiding them in these crucial early steps of their lives in the world. Indeed, if only we all had such a start in life! Wanting to capture the moment, perhaps as a way of “taking their happiness with them,” they asked for a group photo to be taken with Amma. Amma of course happily agreed. However, as the meeting was taking place inside the enclosed stage of the new temple hall there wasn’t enough room to get the wide shot needed to include all 100 students! Just as this was being realised, the large doors were flung open wide, revealing the eager faces of Amrita University’s Computer and Engineering students waiting outside in the huge hall for their turn with Amma. So, smiling as always, Amma came forward into the door’s archway, surrounded by 100 future doctors, and had the photo snapped from the floor below, finding the wide shot that was needed. Fortunate students indeed, and it’s a fortunate world that will soon be receiving healers inspired by the greatest Healer of all. It was late in the evening of 14th August, and Amritapuri witnessed a quiet metamorphosis, brought about by the engineering and computer students of the Amrita Institutions. At around 10 pm, as Amma led the chanting of Lokah Samastah Sukhino Bhavantu, the youth started lighting lamps on the floor of the expansive Devi Bhava Hall in the Ashram. In a few minutes, what emerged was a string of lamps outlined as the map of India. As the lights of the diyas shimmered against the darkness of the night, pairs of boys and girls were also symbolically lighting more lamps within the map contours—to mark the location of major holy pilgrimages and holy rivers of India. Every time a lamp was lighted at a holy location a brief archana, was also performed. The whole scene done in the presence of the Universal Mother, Amma, was indeed an apt homage by the youth to Mother India on the eve of her Independence Day. What made the occasion more memorable was Amma’s message to all her children assembled not only at Amritapuri, but all across the country where Her darling children were celebrating Independence Day. In part, Amma said, “The social and cultural atmosphere of India is different from that of the West. Therefore when adopting western behaviors and attitudes, we should be careful. There are good aspects, which we can accept. By accepting these, we will become expansive. So what is to be accepted and what is to be rejected? That decision has to come from the cultural foundation within, which is hundreds of centuries old. If we adopt western ways impulsively, without exercising proper discrimination, we may find that we can’t truly assimilate it. In time, it may become a burden to us. “In many countries, by the age of 18, 90% of young people either take loans or work to continue with their studies. They are not dependent on their parents. On the contrary, in India, if a son remains unmarried or unemployed even till the age of 40, his mother thinks that it is still her duty to labour hard to nurture her child. A mother does not hesitate to go hungry to feed her adult children. How can a son or daughter begin to repay their debt to their mother who carried them in the womb for 10 months and gave birth to him or her after suffering so much? The child gives the mother so much trouble, not even allowing her to sleep through the night. But the mother bears all this with a smile, loving her child unconditionally. After Amma’s message was read aloud, the students delivered a series of delightful dramas and dances. Finally, Amma led all present in singing the bhajan, “He Giridhara Gopala”. Her lilting voice transported Her children to a realm of love and longing for the Divine. Question: Amma, could you please give us some instructions about marriage and married life? Amma: Marriage and married life, in fact, are another way to attain God-realization, although many are not aware of it. For the attainment of this goal, both the husband and the wife need a certain amount of understanding about leading a married life coupled with spirituality. Patience, love and forgiveness are the three qualities that are needed to maintain a good relationship. In most cases, neither the husband nor the wife will have these qualities. Such relationships will always end up in a tragedy. Doubting each other’s love, they will always quarrel. A silly, insignificant incident or sometimes even a single word is enough to make them lose their mental balance. They will always blame each other, but never try to find a solution for the misunderstandings and conflicts. As a result, they suffer and also cause their children to suffer. Question: Why is there no real love in married life? What causes the conflicts and the friction? Question: How should one keep good relations with one’s wife and children and with the other family members? How fortunate we all are to be in a Guru-disciple relationship, living so intimately with a Mahatma like Amma, who is ever established in the Supreme Consciousness. We have so much personal contact with Her, and we are able to see the various ways in which She instructs and uplifts Her disciples and devotees. Many different types of people come to Amma, each needing the guidance appropriate for him or her at different times. Just as various Divine forms, with their different qualities, are needed to represent God, Amma assumes many bhavas (moods) and characteristics in order to lead Her children to the Divine State, beyond all words and forms. Sometimes the Guru’s teachings and even the scriptures say contradictory things, and we may become confused upon encountering this. One moment Amma says, “God is the childlike innocence in you,” and the next moment She says, “God is Pure Consciousness, or Pure Love, or Compassion.” Well, which one is He? Our minds want to know. Or Amma will say, “God is in your heart.” Then She will say, “God is everywhere.” Where is He? When we isolate just a few verses of the scripture or just a few words of the Guru, it is actually quite easy to become confused and start criticising. But they have to be read or listened to in their entirety, with faith and awareness. Otherwise Lord Krishna would have said only that one sloka and been finished. The context actually clarifies the meaning of Sri Krishna’s and Amma’s words. There is a deep, symbolic meaning to each of the examples that Bhagavan gives. He refers to Himself as the essence of each quality listed, to show that, as the Supreme Truth He is the underlying essence of all things. Similarly, “Om” is the substratum of all sound and speech. Because the senses cannot function without the mind, the Lord refers to himself as the mind, but only with respect to the senses. What makes a powerful person powerful? His power. It is not the power of a good person that makes him good, it is his goodness. Like this, in each example cited, the Lord shows how He is the essence pervading the whole, but is not limited or affected by any of its manifestations. In this way, He first helps Arjuna to focus his mind on the essential principle residing in material things with which he is familiar. Once Arjuna’s mind becomes more focused and subtle, it will more easily realise the essential Principle of his own Self and the whole Universe. Amma constantly does the same thing with us. She uses various situations and teachings to draw our minds inward and make them more subtle. Many of Her words or actions may seem contradictory on the surface, but this is simply because the nature of God, or the Supreme Truth, is beyond our intellectual comprehension. As God is beyond the intellect, beyond the material world, we cannot expect any one form, method of explanation, simile, or theory to suffice. For such reasons, around a Satguru like Amma, contradictions and paradoxes become the rule rather than the exception. Contradiction is actually absolutely necessary. Why? Because contradiction goes against reason or logic. Logic is useful only up to a certain point in understanding the Guru and God. At some point it must be dropped, after which our only means of understanding is faith and surrender. It is for the sake of making us drop our mind and reason that the Guru creates the contradictions. I have heard about an incident that happened many years ago at Amritapuri, when there was only one hut in the whole ashram. One day Amma decided that it was time to build two more huts, since more rooms were needed for the new residents. One of Amma’s senior disciples was in charge of supervising the work, and he designed a plan and showed it to Amma. The workers then erected the main poles to support the frame and started to tie the coconut leaves on to the frame. Amma came out of the temple and saw what was going on. “Who told them to do this?” asked Amma. Everyone pointed at the brahmachari, whom Amma then questioned. “Who asked you to place the huts like this?” “Why Amma, you saw the plan and approved of it,” he replied. “I don’t remember seeing any plan. Tear this down! Nobody should build huts facing each other. All you think of is how to be comfortable, how to get a good breeze! Don’t you care about scriptural rules? No! The rules don’t allow huts to be built like this.” Having said this, Amma went back into the temple. The brahmachari helplessly turned towards the workers and asked them to tear down the work that they had been doing since morning. But after two minutes, Amma again emerged from the temple. She looked at the workers who were starting to dismantle the huts. “What are they doing? Tell them to build them the way they originally planned. Otherwise, how is the breeze going to enter the huts?” said Amma. “But Amma, what about the scriptural rules?” the brahmachari asked. “Rules? There are no rules for building huts. That’s only for regular buildings.” After this, Amma went back into the temple once again. So what would an average person observing this whole drama have thought of Amma? Unreasonable or perhaps even crazy. But such a way of dealing with the disciples’ minds is quite in line with tradition. It is reminiscent of the story of the famous Tibetan yogi, Milarepa, and how his Guru made him build and rebuild a seven-story tower many times before he finally approved of Milarepa’s work and granted him initiation. All such actions are simply to help the disciple develop the surrender needed to go beyond his mind. Amma says that the nature of the Supreme is not bound by reason or logic. Likewise, the Guru, whose sole purpose is to guide us to that Truth beyond, cannot be bound by reason or logic either. In Awaken, Children! Amma says, “Don’t try to judge the Master with your intellect. Your understanding of him is bound to be completely wrong. So, we may look as long as we want for reasons to explain the Guru’s mysterious conduct, but we will never find them. We look at the Guru, analyse, judge, and guess, but we will never find the reason, because the reason is inside us. Everything the Guru does is based on our present condition and needs. When we observe the infinite Master, or God, and try to understand Him or Her with our limited intellects, we become like the six blind men that gave varying descriptions of the same elephant. But it is even worse when we think we have understood the Master and then we become totally narrow-minded and intolerant in our views. This is the reverse of the story with the blind men. This time there were six blind elephants who couldn’t agree on what humans were like, so they decided to try to understand what a human was by feeling with their feet. The first blind elephant felt the human with his huge feet and declared: “Humans are flat.” The other blind elephants, after similarly feeling (or squashing!) the human, agreed and the problem was solved. Just as the elephants lacked the subtlety to be able to understand a human with their feet, our minds too are not subtle enough to grasp the Guru’s mystifying ways. So we should remain aware of this fact and do our best to broaden our view, and remain open and receptive to the Real Amma. In the Gita, Sri Krishna says, “Without any insight into my transcendental nature, men of little understanding look upon Me as a mere human individual.” So, like Lord Krishna, Amma in Her Real Nature is transcendental, but She is constantly assuming many different roles and bhavas to remove all our preconceptions about how the Guru or God should be, and how a disciple/devotee should be. Only after She removes all of our preconditioning can She recondition us. Whether it is Krishna, or Amma, the various ways that the Guru utilises are all for removing the subtle ego from the disciple. Because it is so subtle, it is also powerful and pervasive, and very hard to remove. It’s impossible to do it alone. That is why it is said that there is nothing that can be given in return when the Guru removes the disciple’s ignorance. Let us remember that we are receiving great gifts from Amma every day. Amma gives in the real sense. On the surface, She may only give a hug and a toffee, but the giving is taking place on a much deeper level. It actually consists of both giving and taking. On the subtle level, She is filling us with all good qualities, and at the same time She is taking our negativity and prarabdha karma. Since there is no way for us to truly repay Her, we can only strive to emulate the ideal of giving that Amma sets, the ideal of giving selflessly. When we give something, it is usually a rather superficial process. We make some token gift, but on the inside we subconsciously desire to somehow take back something else or get rid of our dissatisfaction within. The way that we give is like the story about the man who had borrowed $50 from his friend Bill. One day they were together in a grocery shop, shopping for their food, when a robber came in and shouted, “Everybody put up your hands! This is a stickup!” The robber then instructed everyone to take out their wallets and throw them on the ground in front of him. The man took the opportunity and said to Bill, “Hey, Bill, remember that $50 I owe you? Here, keep the change!” and he threw his wallet to Bill. This is not real giving; it only amounts to taking from others. This is the type of gift Amma really wants from everyone. She doesn’t want anything material from us. She wants only the gift of renunciation from Her children. Our gift of tyaga actually becomes a gift to the whole world, because Amma has no individual ego, She is the Totality. As a result, when we strive to surrender our ego to Amma, though we may get back nothing materially, our spiritual harvest is infinite. Regarding giving, the Bhagavad Gita says, “Giving simply because it is right to give, without thought of return, at a proper time, in the proper circumstances, and to a worthy person, is enlightened giving. Giving with regrets or with the expectation of receiving some favour or of getting something in return is selfish giving.” Two quotes from Buddhism show how enlightened beings give. “Enlightened beings are magnanimous givers, bestowing whatever they have with equanimity, without regret, without hoping for reward, without seeking honour, without coveting material benefits, but only to rescue and safeguard all living beings.” And: “‘If I give this, what shall I have to enjoy?’ – Such selfish thinking is the way of the demons; ‘If I enjoy this, what shall I have to give?’ – Such selfless thinking is a quality of the gods.” All of these descriptions seem to describe Amma perfectly. Through Her example, Amma shows us the proper attitude of giving. By this definition, Amma is and always has been truly the wealthiest person in the world. Not even Bill Gates can compare. And She has been distributing huge quantities of this spiritual wealth throughout the world for over twenty-five years, but Her supply still hasn’t diminished even a bit. Everyone who comes for darshan walks away with a gem or a gold nugget, though they sometimes don’t even realise its value. And Amma gives it away so freely, her spiritual wealth is inexhaustible. In our present condition, however, we cannot give in the real sense, as Amma does, because we are spiritually poor. In order to give as She does, first we must acquire some spiritual wealth. This is the whole purpose of the Guru-disciple relationship, and of all the sadhana and selfless service that Amma instructs us to perform. By observing Amma’s example, we can learn how to give to all equally, without any expectation. In the same way, if we want to see Amma on a deeper level, see the Real Amma, the incomprehensible Master beyond the intellect, we must remain open and receptive. Let us drop our preconceptions and expectations, and simply be in Her holy presence, with surrender and the openness of a small child. Once we remove the obstacles within our own minds, then all of the Master’s actions become meaningful guidance, and She can take us deeper within to understand Her Infinite Divine Nature. The Ministry for Human Resource Development, Government of India, has, in its order on 8th August 2003, notified that Amrita Institute of Computer Technology (AICT), Amritapuri, is included under the ambit of Amrita Vishwa Vidyapeetham, Coimbatore, with immediate effect. The University Grants Commission had earlier recommended the inclusion of AICT (Amritapuri) under Amrita Vishwa Vidyapeetham after a visit by the inspection team to the Campus. With this, the number of campuses under Amrita Vishwa Vidyapeedham in the country has gone up to three: Ettimadai (Coimbatore), Kochi and Amritapuri. AICT (Amritapuri), started in 1990, was the first institute set up by the Mata Amritanandamayi Math and is today one of the leading institutions offering computer education in the state. The inclusion of AICT (Amritapuri) under Amrita Vishwa Vidyapeetham signals a landmark development in the future of the Amritapuri campus. It is expected that international quality programmes meeting contemporary requirements of society and industry will be offered at the Amritapuri Campus from the next academic year onwards. This includes Graduate and Post-graduate courses in Arts, Sciences (Pure and Applied) and Humanities. Research will take pride of place in all new endeavours carried out by AICT (Amritapuri). It may be noted that the Amritapuri campus recently hosted the national workshop on Information Security and Cryptography – Infocrypt 2003, promoting better understanding and research in this field. Amrita Innovative Technology Foundation (AITF), the research wing of AICT, is increasingly being known globally for its contributions in IT technology. In this overall context, applications from eminent academicians with a clear and integral vision on education are invited. Rich experience in administering educational institutions and designing and implementing new courses will be an added advantage. Interested persons may contact Correspondent, Amrita Institutions, for suitable positions. “Children, when you sit for meditation, do not think that you can still your mind immediately. At first, you should relax all parts of your body. Loosen your clothes if they are too tight. Make sure that the spine is erect. Then close your eyes and concentrate your mind on your breath. You should be aware of your inhalation and exhalation. Normally we breathe in and out without being aware of it, but it should not be like that; we should become aware of the process. Then the mind will be wakeful. “Children, don’t try to still your mind by force when you sit for meditation. The thoughts will rise up with ten times their original force if you do that. It is like pressing down a spring. Try to find out where the thoughts arise from, and control them with that knowledge. Don’t place the mind in any kind of tension. If any part of your body is tense or feels any pain, the mind will linger on that. Relax every part of the body, and watch your thoughts with absolute awareness. Then the mind will subside by itself. “Name and form are ladders to reach the formless. We who are limited cannot conceive of the unlimited. A form is needed to reach the formless. Another thorn is needed to remove the thorn that has pierced our foot. Once the thorn is removed, both can be discarded. Likewise, after reaching the ultimate goal, you can abandon all names and forms if you want. Even when you meditate on the formless Self, you need a pure conception, which is nothing but a thought. That is also a concept, is it not? Even when you meditate on the form of a god or goddess, you are not meditating on an external object but only on your own Self. “A minimum of three years is required to learn to fix one’s attention firmly on the form of meditation within. Initially one must strive for concentration by looking at a photo. If one meditates with closed eyes for ten minutes, then for ten minutes one should look at the form of meditation. Eventually the form will become clear within. “Imagine holding the Divine Mother’s hand and bathing Her by pouring water over Her. Picture the water falling on all parts of Her body and running down. All the while, call out to Her, ‘Mother, Mother!’ and visualise Her form. Imagine doing abhisheka (ceremonial bath) with milk, honey, ghee, sandal paste and rose water, one after the other. When these substances flow down Her body, visualise each part of Her form, from head to foot. Talk to Her, and pray to Her. After bathing Her thus, dry Her body with a cloth. Drape a silk sari around Her. Adorn Her with ornaments. Put a vermilion mark on Her forehead. Put anklets on Her. Put a garland on Her neck and enjoy Her beauty. Now do archana (worship) with flowers. Take the flower, which represents your mind, and imagine offering its petals, one by one, at Her feet. Or imagine offering your vasanas (negative tendencies) in a fire burning in front of Her. After the archana, offer Her the payasam (sweet rice pudding) of your love. Picture that you are doing arati (waving of burning camphor) for Her, and see each part of Her body shining brilliantly in the light of the flame. In the end, imagine that you are circumambulating Mother. All the while keep praying to Her. Try to do all this with pure love. Then your mind will not wander anywhere. “Children, crying has the power to make the mind completely one-pointed. Why do we meditate? To get concentration, isn’t that why? Yes. So, the best way to get concentration is by crying to the Lord. That is a very powerful way of remembering God, and that, in fact, is meditation. That is what great devotees like the gopis and Mirabai did. See how selflessly Mirabai prayed, ‘O Mira’s Giridhari (Krishna), it does not matter if You don’t love me. But, O Lord, please do not take away my right to love You.’ They prayed and cried until their whole being was transformed into a state of constant prayer. They kept on worshipping the Lord until they were totally consumed by the flames of divine love. They themselves became the offering. Once you become the offering, once your whole being is in a state of constant prayer, then what is left is not you but Him. What is left is love. Prayer can perform this miracle. Crying can accomplish this feat. What is the purpose of meditation? It is to become love. It is to attain oneness. Thus there is no better meditation technique than praying and crying to the Lord. “Let the heart melt in prayer. Unfortunate indeed are those who think that crying to God is a weakness. As the wax melts, the flame of a candle only burns brighter. Through crying to God, one gains strength. These tears wash away the impurities of the mind. If one cries for God for five minutes, it is equal to one hour of meditation. Such crying makes the mind easily absorbed in the remembrance of God.